This post was done in partnership with Pampered Chef, who sponsored this post by providing the baking tools used throughout the post and the compensation to make it happen. As always, all thoughts and opinions are my own, and I was incredibly happy to work with Pampered Chef because of their awesome selection of kitchenware. Thank you for supporting Hummingbird High and my awesome sponsors! We are in the midst of cookie season, and I am baking cookies left, right, and center. I suppose it's a nice change from my book — I'm still working on the cakes chapter of #WEEKNIGHTBAKING, but I've now graduated from loaf cakes to layer cakes. I'm not going to lie. I'm in a tough spot at the moment. I spent all of last week trying to perfect a white wedding cake recipe and failing, desperately texting the baking experts/friends I knew (shoutout to Molly, Erin, Tessa, and Stella for dealing with my needy questions) about my troubles. In the end, I was defeated. My friend Kumi had to take me out for a glass of wine and fries. I decided to take a break and focus on cookies. 1. Designate a work area. Rolling out sugar cookies can take up a lot of space. It can get messy fast, especially as the work surface needs to be floured in order to prevent the cookies from sticking. In order to minimize mess, I like to make sure I do all my work in one counter of the kitchen. I keep it fairly tight, and make sure that all the tools I need — my jar of flour, my rolling pin, my cookie cutters — are within an arm's reach. 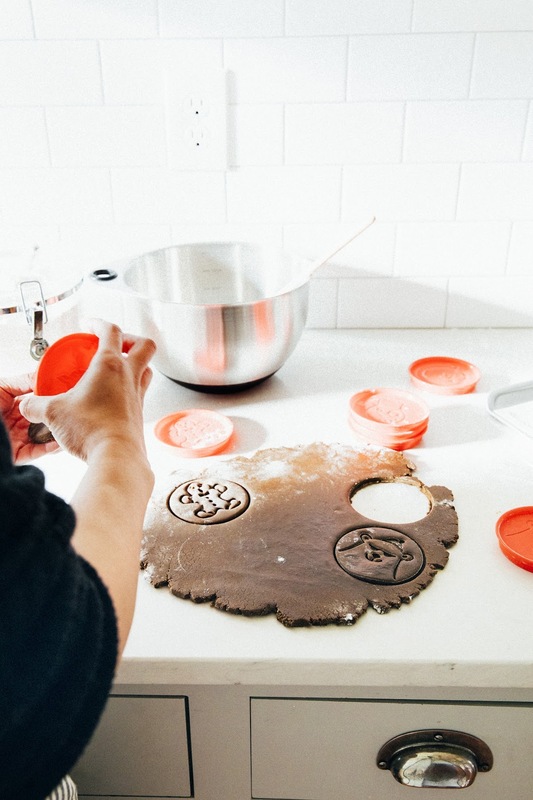 The cookie rolling process will go a lot easier if you have the right tools for the job. For instance, I like to use a marble rolling pin (like this one from Pampered Chef) to roll out the cookies. The marble helps keep the dough cool to prevent it from getting too soft and sticking to the counter. It's heavy enough to help you roll out any tough doughs, but not so heavy to be hard to manage. For baking the cookies, I also like using this silicone baking mat from Pampered Chef. 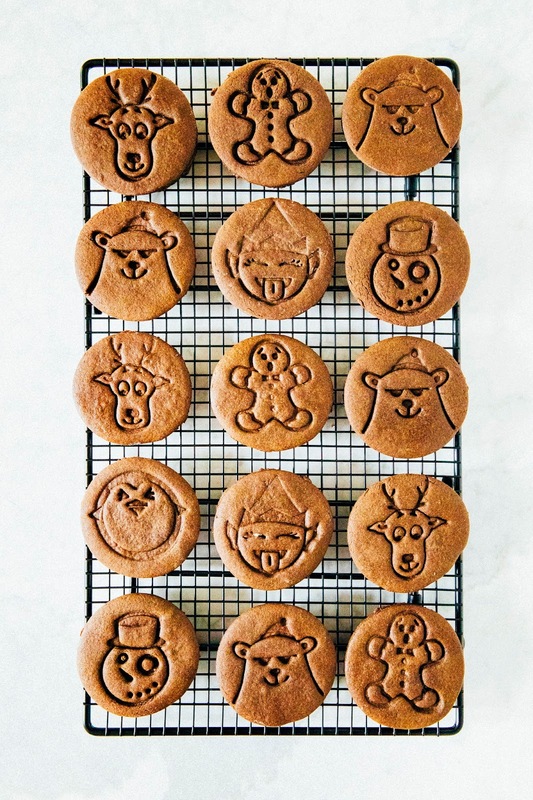 It has outlines to help you space out the cookies across the pan for even baking and help prevent them from spreading out and getting stuck to each other. You don't want all that hard work of rolling and stamping to go to waste. Chilling the cookies before baking helps them keep their shape in the oven and prevent from spreading too much. I know it's annoying, but don't skip this step, especially when working with a butter based dough! It's the secret behind any beautiful sugar cookie. That's it. Now you know all my secrets. Plus another one — this dark and stormy sugar cookie recipe. I'm always trying to think up of new ways to modernize a traditional sugar cookie recipe. This time around, I developed a recipe based on one of my favorite cocktails: the Dark 'n' Stormy, made with dark rum and lime. This cookie is flavored with rum, lime, and molasses; it's very similar to a gingerbread or gingersnap cookie, but much softer and with the texture of a traditional rollout sugar cookie. You can use royal icing to fill in the patterns, or drizzle with some sort of lime icing glaze; however, the cookies' flavor is good enough to stand on its own without any of those extras. It's one of the presents I'll be handing out to friends and family this year. Enjoy! This recipe uses Dutch processed cocoa powder, as opposed to natural unsweetened cocoa powder. Dutch processed cocoa powder has been treated so that the acids in the cocoa are neutralized, leading to a milder flavor and a darker color. You can read more about it on this awesome Serious Eats post. It's what's responsible for the beautiful, dark hue of these cookies, so make sure you use the right kind of cocoa powder! 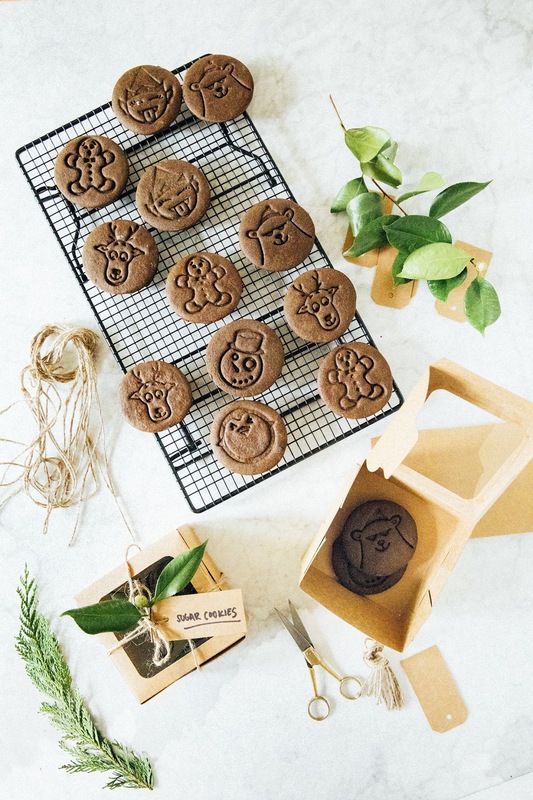 When using cookie cutters with outlines/stencils on them, there's a possibility your cutters will get stuck in the rolled out dough if they're not floured properly. Dip each cutter in a bowl of flour, tapping out any excess flour before stamping onto the dough. 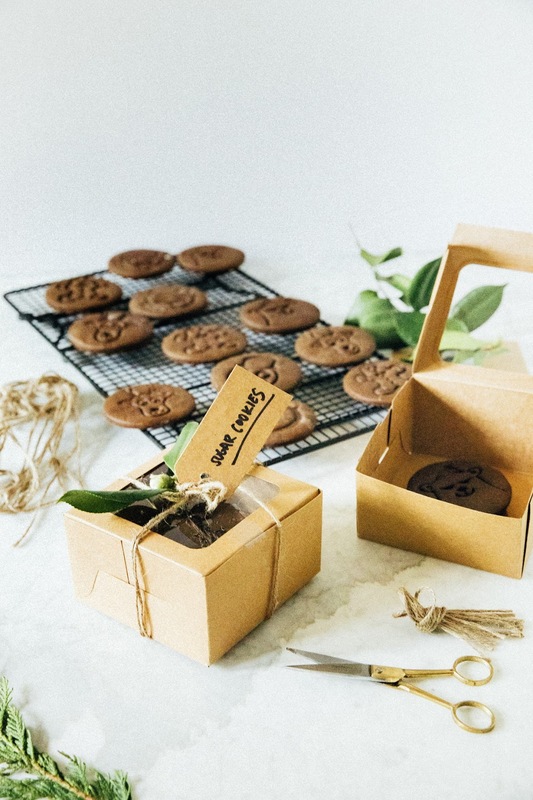 Don't panic if you accidentally get flour onto the cookies — after they've been chilled, they'll be hard enough to handle that you can pick one up and give it a gentle tap over the sink to shake out any excess flour before baking. The cookie dough recipe yield will vary depending on the shape and size of your cookie cutter. I made around 30 cookies using a three-inch round cookie cutter. In the bowl of a freestanding electric mixer fitted with a paddle attachment, combine 1 cup dark brown sugar and fresh zest from medium limes. Use your fingers to rub the zest into the sugar until incorporated throughout — this will help release oils from the zest and make your sugar more flavorful. In a medium bowl, combine 3 1/2 cups all-purpose flour, 2 tablespoons Dutch-processed cocoa powder, 2 teaspoons ground ginger, 1 teaspoon ground cinnamon, 1/2 teaspoon kosher salt, and 1/4 teaspoon ground cloves. Whisk to combine and set aside. Return to your sugar and zest mixture and add 3/4 cup unsalted butter, 1/2 cup blackstrap molasses, and 2 teaspoons dark rum. Beat on medium speed until smooth; lower the mixer speed to its slowest setting and add 2 egg yolks, one at a time, only adding the next egg yolk when the previous one is fully incorporated. With the mixer still on its slowest setting, add the dry ingredients gradually and continue beating until just combined. Once the dough has come together, use a rubber spatula to scrape the dough onto a lightly floured surface. Knead gently for 1 to 2 minutes, until the mixture is pretty uniform. Wrap in plastic wrap and transfer to the refrigerator to rest and chill for 1 hour. When the cookie dough has rested, center a rack in the oven and preheat to 375 (F). Line two baking sheets with parchment paper and set aside. Transfer the cookie dough from the refrigerator to a lightly floured surface. If the dough is too hard to work with, give it a whack or two with a rolling pin until it becomes more pliable. Use a rolling pin to roll the dough into 1/4-inch thick slab. 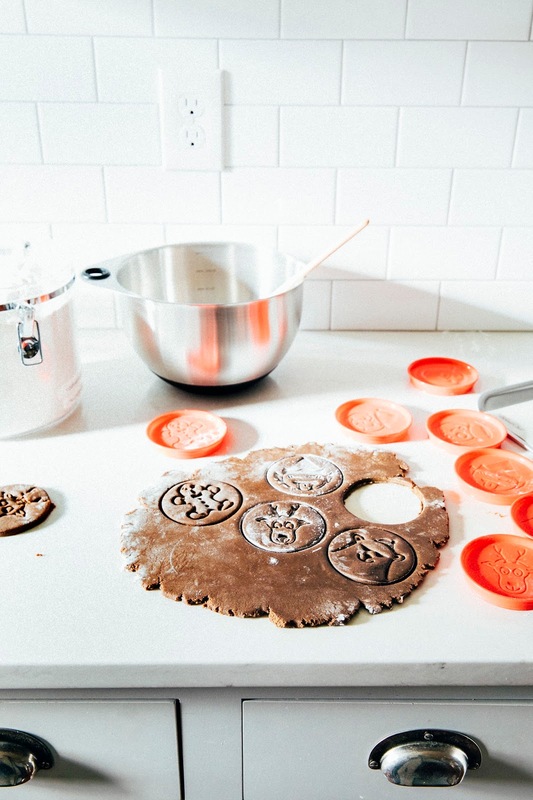 Use cookie cutters to stamp out cookie shapes. Gather any scraps and reroll, repeating the process until all the dough is used up. 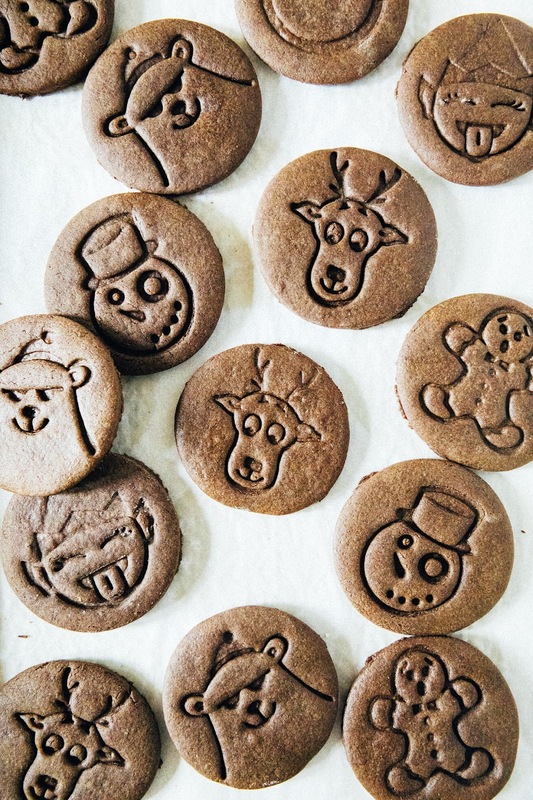 Transfer the cookie shapes onto the prepared baking sheets, leaving 1 inch between each cookie. In theory, the cookies shouldn't spread out that much but will puff up instead. Transfer one baking sheet to the freezer and chill for 10 minutes, before transferring to the preheated oven and baking for 10 minutes. Because the cookies are dark, it can be hard to tell when they're done — they should be firm to the touch but not too firm. Resist the urge to bake them any longer because they'll firm up as they cool! Transfer to a wire rack to cool completely. Repeat with the remaining baking tray.